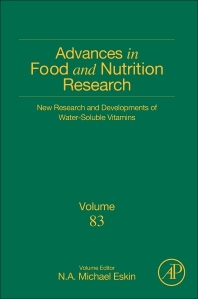 New Research and Developments of Water-Soluble Vitamins, Volume 83, provides updated knowledge about nutrients in foods and how to avoid their deficiency, especially for those essential nutrients that should be present in the diet to reduce disease risk and optimize health. The book provides the latest advances on the identification and characterization of emerging bioactive compounds with putative health benefits. With up-to-date information on food science, including raw materials, production, processing, distribution and consumption, it is an ideal resource for nutritionists and researchers alike. Michael Eskin graduated from the University of Birmingham (U.K.) with a B.Sc. (Honors) in Biochemistry and a Ph.D in Physiological Chemistry .Since 1968, he has been at the University of Manitoba, where he has is a professor in the Department of Human Nutritional Sciences in the Faculty of Human Ecology Ecology. In addition to serving as Head of the Department, Dr. Eskin also served as Associate Dean of the Faculty. Recently the department was combined with the Department of Food Science in the Faculty of Agricultural and Food Sciences to form the Department of Food and Human Nutritional Sciences. Dr. Eskin was involved in the early investigations on the properties and performance of canola, which continues to be one of his areas of research. In 2016 he was awarded the Order of Canada, the highest civilian honor by the Government of Canada, for his significant contributions to the success of the Canadian canola oil industry. Dr. Eskin has authored, co-authored, edited and co-edited fourteen books, sixty chapters and over 125 papers. He is the recipient of a number of prestigious awards for his lipid research including the Stephen S. Chang Award by the Institute of Food Technology (IFT), the Timothy Mounts Award and Alton E. Bailey Medal by the American Oil Chemists’ Society (AOCS) and the William J. Eva Award by the Canadian Institute of Food Science and Technology (CIFST). He has been very active in a number of Scientific Societies and is a Fellow of IFT, AOCS, CIFST and the Institute of Food science & Technology (UK). He sits on the boards of a number of international journals and for the last 6 years served as co-editor of Lipid Technology.